DESCRIPTION: Excellent income opportunity!! 31.11 acres with 20 storage units. There are 12 5x8 units and 8 8x10 units. Property also features a 1,000 Sq. Ft. apartment and open storage stalls. There are also close to 30 open sided 12x40 stalls for storage. Many possibilities with this property. DRIVING DIRECTIONS: Sterling Highway south to aprox. MP. 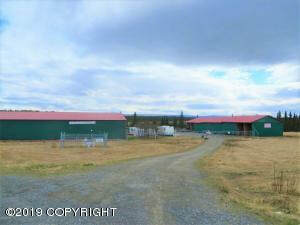 118, property is on the corner of Blueberry Avenue and the Sterling Highway, accessed off of Blueberry Avenue. Look for sign.